You are here: Home / 30 minutes or less / Honey roasted rhubarb smoothie bowls + a Vitamix blender giveaway! Honey roasted rhubarb smoothie bowls + a Vitamix blender giveaway! Super simple, healthy, and beautiful honey roasted rhubarb smoothie bowls! Make your smoothie into a meal by topping with your favorite super foods! Disclosure: This post is sponsored by Vitamix. Vitamix has provided a blender for the winner of this giveaway. All opinions are my own. It’s rhubarb season! OMG OMG OMG! Um………. obvs my favorite food season of the year. Fave vegetable EVA! Be prepared for a lot of rhubarb recipes coming your way. Mother’s day is coming! It will be here in just a few weeks. EXACTLY 2 weeks. Are you prepared? Alright alright alright. Are you pumped now? So, I keep seeing these really gorgeous smoothie bowls around the interwebs. They always look way too pretty to eat, don’t they? Like they’re not real food or something. Buuuuut….. they are. Super simple to make too guys. I thought that a smoothie bowl would be a GREAT Mother’s day recipe. It’s easy, it’s gorgeous, you can make it with your kids, you can impress your mom, you can customize the toppings to your faves. Good stuff. Seriously good stuff. Honestly, as a preggers lady, smoothie bowls are kind of amazing. I can pack them full of everything healthy, and it still seems like an exciting meal. Toss the rhubarb pieces with the honey until evenly coated. Spread evenly on the baking sheet and roast for 15 minutes. Let cool slightly. Blend in a blender with the yogurt until smooth. Serve in your favorite bowl and top with your favorite toppings! “This giveaway is open to residents of the continental United States and Canada (void in Quebec) who have reached the age of majority at the time of the contest in the state, province or territory in which they reside. No purchase necessary to enter. Need some Mother’s day gift ideas? Vitamix has put together an awesome Mother’s day gift guide! Check it out! Alright guys, happy Sunday to you. And good luck! What a gorgeous smoothie both! That looks amazing! I’ve never had raw rhubarb but this sounds yummy! I didn’t know you could eat rhubarb raw – I always use it in cooked desserts! Have to give it a try! I love rhubarb in savory dishes too! OH YUM!! Love the colors and textures you have here! 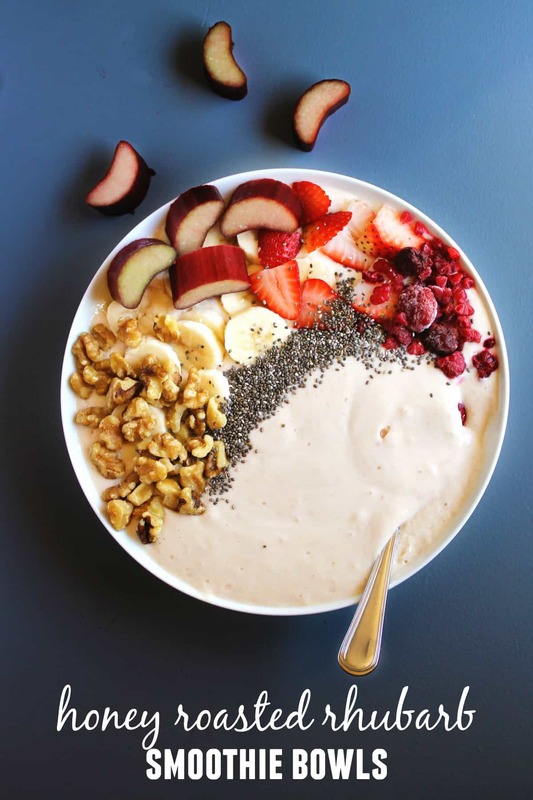 This breakfast bowl would me happy all day long! And that giveaway is so tempting!! I am loving your Honey Roasted Rhubarb Smoothie Bowl!!! It looks so beautiful. This is a perfect breakfast treat! I love rhbuarb. It is only in season for such a short time. I added it to an apple pie last night. Your recipe is a great way to enjoy them. Thank you, Peter! I go a bit crazy with rhubarb in the Spring, because it’s only around for a handful of months. Glad to know I’m not the only one! I just started getting rhubarb in the CSA last week! So pumped! Your posts are always so beautiful and this one is no exception 🙂 This smoothie bowl looks delicious! This looks delicious. Just what I need to add jumpstart my mornings! I love rhubarb but it’s so hard to find around here. Next time I do, I’m making this smoothie! This would work really well with frozen rhubarb if you can find that! I have to confess that I’ve never cooked with rhubarb before – gasp – i know!!! Need to get on it! This sounds delicious though. Happy to be hosting this giveaway with you! Tweeting, pinning, yumming! Ha! I think a lot of people are intimidated by rhubarb! I can just eat it raw, but most people need to add a lot of sugar. You should give it a try! I am a huge fan of smoothie bowls! It’s perfect for days when I want a little more texture. Adore rhubarb! This is one seriously stunning smoothie bowl Trish! I want to dive right in! Hi Trish! Life has been so busy I haven’t had a chance to visit your fun and beautiful blog lately! I love your smoothie bowl and I have just developed a love for rhubarb in the last year. Not sure why I was avoiding it all these years, lol. Always enjoy my visits here and your gorgeous photos! Thanks so much Robyn! And yes, isn’t rhubarb the BEST!!?? I would love some of this smoothie bowl right about now. It grows like weeds around here! I love it so much! Trish, your smoothie bowl looks absolutely amazing!! The colors!!! And your writing, as always cracks me up ?